We all do it each year – we dye and paint eggs for Easter, or simply buy them. Has anyone ever thought about why we do it? The tradition of painting and decorating eggs pre-dates Christianity. The first Easter eggs were birds’ eggs. Although we still use birds’ eggs, we opt for chicken eggs only. My grandma once told me that she painted hard-boiled turkey eggs or any other birds’ eggs they could find on their farm – duck eggs, for example. She said that there was no difference which eggs people used. A few days ago I conducted a small public opinion poll and found out that two out of ten people still paint turkey eggs for Easter. No matter whether you are going to paint real or plastic eggs, here is the truth behind this annual activity. So, why do we paint eggs for Easter? People worldwide believe that eggs are the symbols of rebirth, new life, fertility, and the resurrection of Jesus Christ (for Christians). The Orthodox and Eastern Catholic churches have a tradition of painting hard-boiled eggs red in order to represent the blood of Christ that was shed on the cross. According to the old Anglo-Saxon legend, when Eostre, the Anglo-Saxon goddess of Spring and of Rebirth, found an injured bird, she knew that this bird would not survive the cold winter season so she decided to transform it into a hare. When this hare discovered that it could lay eggs (I know it sounds unbelievable, but it is a legend! ), it decorated the eggs and gifted the goddess with them each spring. King Edward I of England made the tradition of painting and decorating eggs even more significant. In 1290, he ordered 450 eggs to be colored and gold-leafed for Easter presents for the royal household. It was a beautifully luxury gift. There are many egg-related traditions around the world. 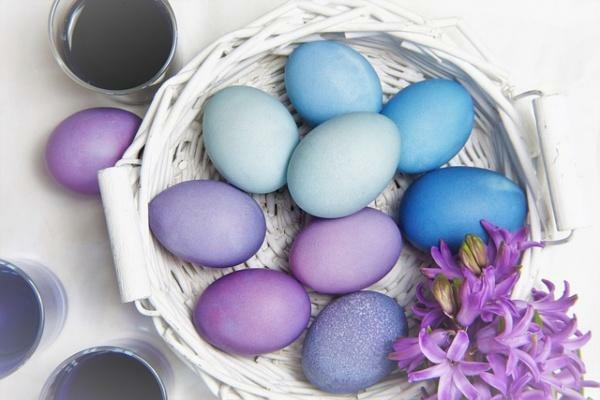 Some of the most popular include egg rolling, Easter egg hunts, Pace Egging, Egg jarping, etc. Children love Easter egg hunts. If you have a child, hide a few eggs around the house and ask your little one to find them on Easter morning, or any other part of the day. It is like a scavenger hunt, but more interesting. A popular Easter Monday sport, egg rolling,also known as an Easter egg roll, is a favorite activity of many Britons. People roll painted hard-boiled eggs down a hill. The winner is the person whose egg rolls the longest distance or between two pegs, or survives the most rolls. Some people claim that egg rolling has no religious significance, while others say that it has some religious reasons. Egg rolling has become a popular activity in the United States as well. Egg jarping, or egg tapping, is one of the most popular traditional Easter games. I know this game as egg fight, and you may call it egg knocking. The aim of the competition is the only one – see whose boiled eggs are the hardest. While this game is perfect for families with kids, it is also a fun activity for couples. Easter is one of the major holidays of the year. It has many traditions that people can’t explain these days. Painting eggs is probably one of them. Unfortunately, modern people take most holidays and their traditions for granted. We celebrate Easter and follow its traditions because other people do it so we know that we have to do it too. However, it is crucial to know at least something about the holiday and teach your children to appreciate traditions. People paint eggs for different reasons. Be it religious or common, it is hard to skip this tradition. I suggest painting your own hard-boiled eggs instead of buying them. First of all, because you know that they are fresh and organic. What Easter traditions do you follow? Do you know why you paint eggs each year? Share your thoughts with us please.